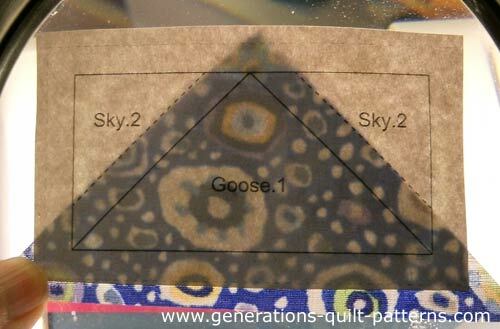 Paper pieced Flying Geese are perfectly accurate, because after the stitching is complete, they are trimmed to size. But perfect units make assembling ANY BLOCK so much easier, so much faster. And we've added placement lines to the free patterns for you to download to speed up the process to maximize YOUR piecing time! Hate to paper piece? Don't worry. We've got you covered! 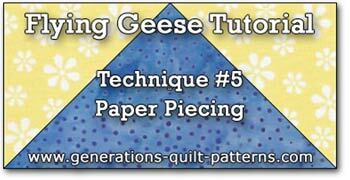 Just click here to learn other quick techniques for making one of quilting's most basic blocks. The patches for this Flying Geese technique are cut amply over-sized so that piecing is wickedly foolproof—you won't be spending time un-sewing misaligned patches and shredding your pattern. I suggest that you make several of these blocks using our dimensions. THEN decide if you need to adjust the size of the patches. 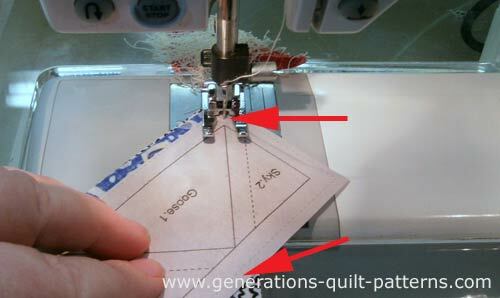 What's important is that the patch size works FOR YOU and maximizes YOUR quilting time! Use the chart below to choose the size that you need. Download and print the corresponding pattern. Each sheet contains 4 units since most blocks require multiples of four Flying Geese for symmetry. ¾" x 1½"	 1" x 2"	 1¼" x 2½"	 1½" x 3"	 2" x 4"
In our example, the 'Geese' are dark, but that doesn't mean you can't change the color values around. 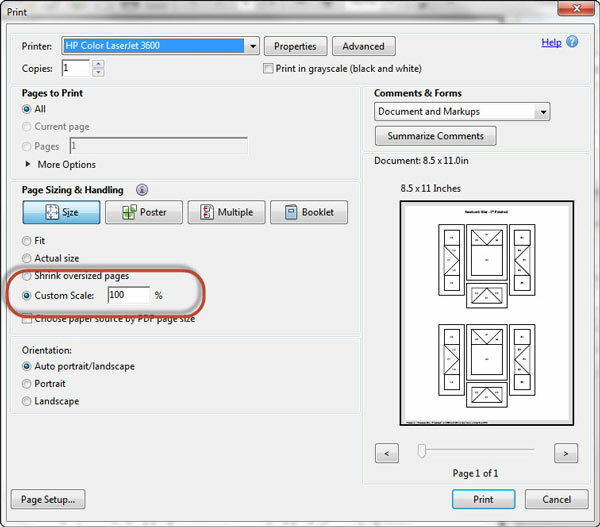 To make sure that the points show, choose fabrics with enough contrast. The quantities below are to make four units. If you need only one Flying Geese, reduce the quantity of Sky.2 from 4 to 1. You will then have 3 leftover Geese quarter square triangles. The dimensions are for squares, i.e. for a 2" x 4" unit, from your Goose.1 fabric cut one 5-5/8" x 5-5/8" square. Then sub cut it twice on the diagonal. Unfinished unit measures...	 1¼" x 2”	 1½" x 2½"	 1¾" x 3”	 2" x 3½"	 2½" x 4½"
Cut out the patterns just outside the dashed line. Won't worry about being neat, we'll clean up things in Step 4. 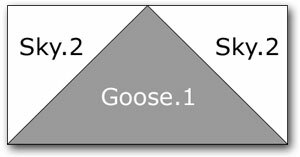 To add a Sky.2, with RST, match the bias edge of one with a bias edge of Goose.1. It doesn't matter which side goes first, though I suggest you be consistent. That way, if you are making a number of these, they can be chain pieced efficiently. YES! 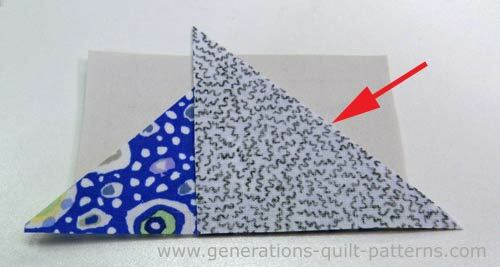 You can chain paperpiece if the line of stitching runs from edge to edge of the paper pattern. Stitch from the printed side, starting and stopping outside the outside dashed line (see arrows). No need to backstitch. Just like a regular block, subsequent piecing secures the thread tails. Repeat for the second Sky.2. Press again. Here it is in all its untrimmed glory! 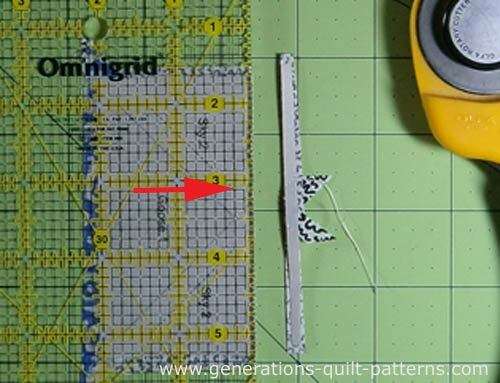 Trim to size by aligning the 1/4" mark of your ruler (see arrow) with the solid outside line. Trim with your rotary cutter. Repeat for the remaining sides. Your thread tails are all automatically trimmed because all the lines of stitching began or ended outside the unfinished edge of the block. Remove the paper and give your Flying Geese unit a final press. This is your finished Flying Geese unit! Perfectly accurate and ready to be pieced into your next quilt or quilt block. There's ore than one way to cook a 'geese'?! Click here to find them under Flying Geese (naturally!) 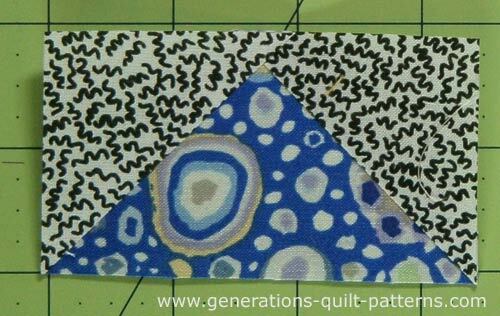 in our Beginner Quilt Block Pattern series. 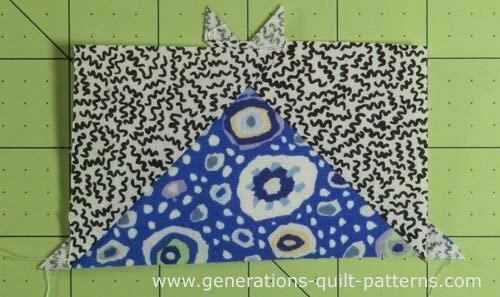 There you'll also find a variety of tried and true methods for making half and quarter square triangles, Square- and Triangle-in-a-Square quilt blocks, Rail Fence units and several other of the basic building blocks of quilting. You're sure to find a method to suit your needs and skill level! 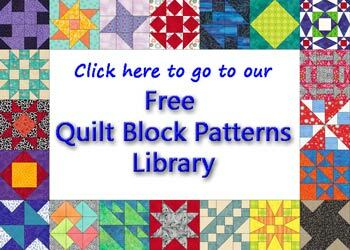 When you're ready, move on to our Free Quilt Block Patterns Library where you can put your newly polished skills to good use.